You can take advantage of the photos on the iPhone in several ways. In each case, you tap the picture and make sure the picture controls are displayed. Then tap the action (or share) icon, at the bottom-left (and shown in the margin) to display the nine choices shown. After tapping Send but before the picture and accompanying message are whisked away, you have the option to reduce the image size (small, medium, or large) or keep the actual size. Consider the trade-offs: A smaller-sized image may get through any limits imposed by your or the recipient’s Internet provider or company. But if you can get the largest image through, you will give the recipient the full picture (forgive the pun) in all its glory. You can also press and hold on the screen until a Copy button appears. Tap that button, and now you can paste the image into an e-mail, a text, or an iMessage message. But there’s another easier way to send a picture via Message. Message: Apple and your provider support picture messaging through what’s called MMS (Multimedia Messaging Service). Tap the Message icon, and the picture is embedded in your outgoing message; you merely need to enter the phone number or name of the person to whom you’re sending the picture. If that person is also using an iOS 5 or iOS 6 device, or a Mac running OS X Mountain Lion, the photo will be sent as an iMessage, which doesn’t count against your texting allotment. Photo Stream: Photo Stream is a neat way for anyone exploiting iCloud to have pictures automatically show up in a special Photo Stream album. Tap Photo Stream to add the image to a particular photo stream. Twitter: Lots of people send pictures via Twitter these days. The iPhone makes it breeze. Tap the Twitter icon and your picture is embedded in an outgoing Tweet. Just add your words, sticking to Twitter’s character limit of 140. You can also add your location to the Tweet by tapping the Add Location option that appears. Oh, and remember to enter your Twitter handle in Settings. Facebook: Tap the Facebook icon to add your picture to the world’s most popular social network. At your discretion, you can add your location. And remember to add your Facebook credentials in Settings. Assign to Contact: If you assign a picture to someone in your Contacts list, the picture you assign pops up whenever you receive a call from that person. Tap Assign to Contact. Your list of contacts appears on the screen. Scroll through the list to find the person who matches the picture of the moment. As with the Use as Wallpaper option, you can drag and resize the picture to get it just right. Then tap Set Photo. 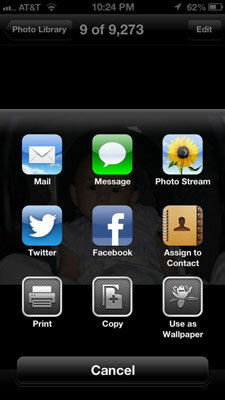 You can also assign a photo to a contact by starting out in Contacts. Start by tapping Phone→Contacts. From Contacts, choose the person and tap Edit→Add Photo. At that point, you can take a new picture with the iPhone’s digital camera or select an existing portrait from one of your onboard picture albums. To change the picture you assigned to a person, tap his or her name in the Contacts list, tap Edit, and then tap the person’s thumbnail picture, which also carries the label Edit. From there, you can take another photo with the iPhone’s digital camera, select another photo from one of your albums, edit the photo you’re already using (by resizing and dragging it to a new position), or delete the photo you no longer want. 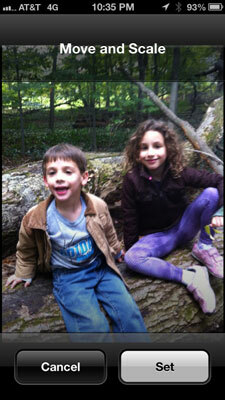 Print: If you have a wireless AirPrint-capable printer, tap Print to print the photo. You can choose how many copies of the print you want to duplicate. 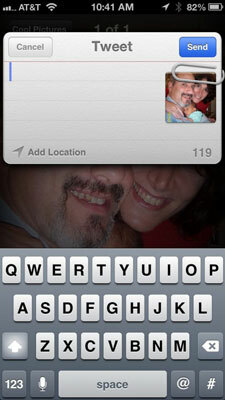 Copy: Tap this option to make a copy of an image that you can embed in an outgoing text message. Use as Wallpaper: The default background image on the iPhone when you unlock the device is a gray background with raindrops. Dramatic though it may be, you probably have an even better photograph to use as the iPhone’s wallpaper. A picture of your spouse, your kids, or your pet, perhaps? When you tap the Use as Wallpaper icon, you see what the present image looks like as the iPhone’s background picture. And, you’re given the opportunity to move the picture around and resize it, through the now familiar action of dragging or pinching against the screen with your fingers. When you’re satisfied with how the wallpaper looks, tap the Set button. Options appear that let you use the photo as wallpaper for the Lock screen, the Home screen, or both. Per usual, you also have the option to tap Cancel. From a thumbnails view of your pictures (refer to Figure 9-4), tap the Edit button at the upper-right. The Share, Add To, and Delete buttons appear at the bottom of the page. Tap each image in the thumbnails view that you want to share, copy, add to an album, or delete so that a check mark appears. Tap Share, Copy (an option under Share), Add To, or Delete, depending on what you want to do. If you tap Share from here, you have the option to Tweet the photo, add it to Facebook, or print it. If you tap Share→Copy, you can paste images into an outgoing e-mail, text or iMessage message. If you tap Add To, choose the album you want to add the picture to. If you tap Delete, you get the chance to change your mind.